SF News, Aug 27, 1952: "SUTRO BATHS - AND ERA - TO CLOSE--The doors will close forever the evening of Sept. 1 on this building, whose indoor attractions have made it, for more than half a century, a San Francisco institution as well as landmark. ", 1952 - Courtesy of San Francisco History Center, SF Public Library. San Francisco News, August 27, 1952: "SUTRO BATHS - AND ERA - TO CLOSE--The doors will close forever the evening of Sept. 1 on this building, whose indoor attractions have made it, for more than half a century, a San Francisco institution as well as landmark. Demolition of the structure, whose operating losses forced the decision on the present owner, Adolph G. Sutro, will bring nostalgic regrets to thousands of San Franciscans." 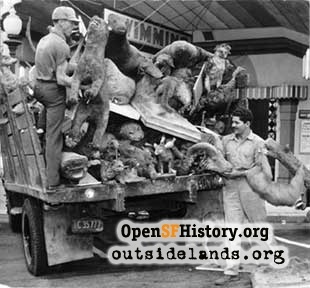 San Francisco News, September 10, 1952: "Cleanup Day At Sutro Baths--The Stuffed animals and other curiosities which have decorated the interior of Sutro Baths for lo, these many years, were crated today and hoisted abroad a truck for fast delivery to the dump. Ray Wayne and Joe Herrera are doing the job." View a Sutro Baths Program from 1897! The images are about 50k each. Thanks to Christine Miller! Photos courtesy of Cliff Tune (page is about 75k). Thanks to the National Park Service - Cliff House Visitor Center! Page launched 4 July 2002; updated 8 November 2003.